Bike Tours Rhode Island | 3-Day Itinerary - See you in 2017! , Block Island's unique harmony of land, sea, and people features stunning views at every turn. Also a National Wildlife Refuge, the island is internationally recognized as one of the most important migratory bird habitats on the East Coast. We explore the island's magical scenery on both bicycle and foot. Guests can hike two of the island's most spectacular trails, along the majestic cliffs of Clay Head and through Rodman's Hollow, a peaceful nature preserve. We stay at the beautiful Rose Farm Inn, chosen as the most popular Block Island destination on Trip Advisor. , birthplace of America's foremost portrait artist and the site of the first snuff mill in America. We'll explore Conanicut Island, biking past active farms, historic properties, windmills, and the remains of old military fortification. A shuttle/ferry takes us to Newport. Our accommodations, the Hotel Viking, has been selected by the National Trust for Historic Preservation as one of America's historic properties. , explore the historic waterfront, or visit the boutique shops. A stunning morning ride takes cyclists along Newport's famous Ocean Avenue. After checkout, a shuttle returns guests to the airport, train station, or vehicle lot. 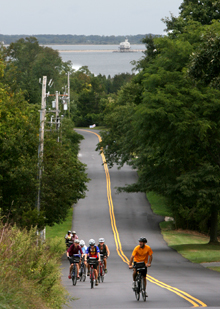 Guests wishing to extend their stay in Newport receive a 20 percent discount at the Hotel Viking if booked through Coastal Biking Adventures.